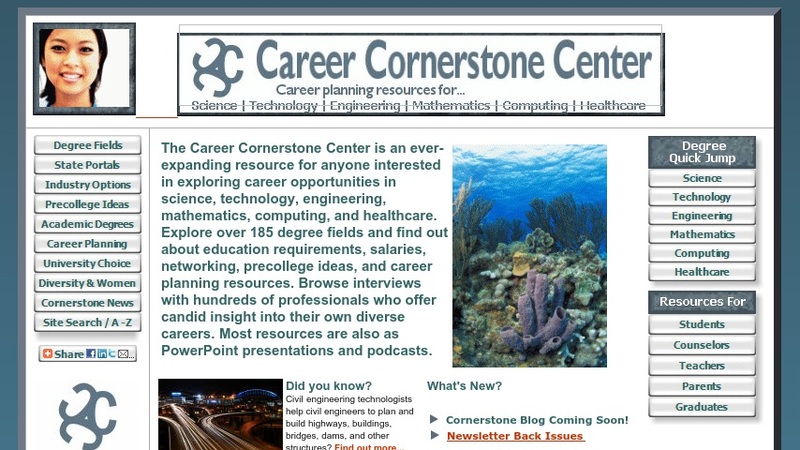 The Sloan Career Cornerstone Center is "a non-profit resource center for those exploring career paths in science, technology, engineering, and mathematics." For each discipline the website provides students a sense for what it's like to be a mathematician, engineer, or technician in industry, business, or government. The website includes a collection of profiles of individuals working in these fields, including details on their educational background and job descriptions as well as video footage of interviews. Other features of the website include an overview of applications for each discipline, ranges of compensation for jobs in the field, and descriptions of the sectors in which they might work. Resources and advice on how to prepare for and research jobs, as well as ways to continue one's professional development, are also provided. The Day in the Life section reviews some typical problems, work environments, skills, activities, and offers additional advice for career seekers. The Center offers all this information on a variety of engineering careers including Aerospace Engineering, Industrial Engineering, Engineering Technology, and Nuclear Engineering. Additional fields, including those in the life sciences, will be added in the future. The content on the website was originally part of a CD-ROM and video series completed with contributions from various national organizations and associations.